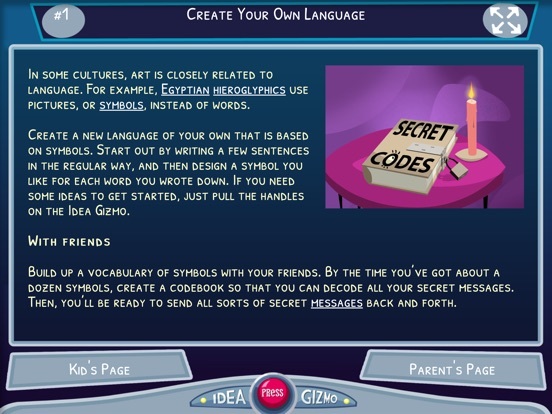 Start With Art By Madcap Logic, LLC is a great art educational tool that is curriculum based and offers high quality animated videos and learning activities through four lessons. The app features three fun characters – Furnace, Ruby and Tickles - that help children learn about the world of art and creativity. The app meets the National Standards for the Visual Arts, and for all the content that you get it is very good value for money. We had a lot of fun with Start With Art and we highly recommended, therefore the 5 stars EAS Certification and the EAS Recommended status. 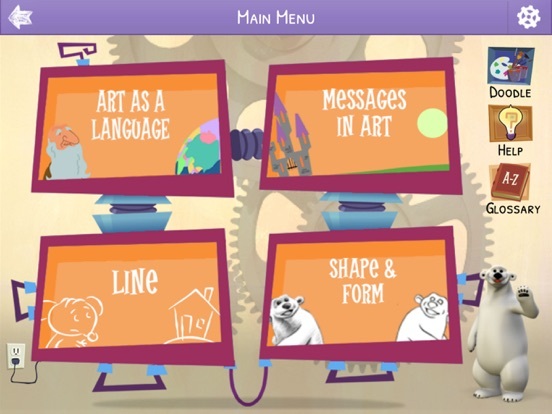 We always get excited when we get to review an app as good as Start With Art The app covers the basis for learning about art and does it in such an imaginative way that it will appeal to everyone above 7 years old. In order to use the app you first have to make sure you are connected to an Internet network as the app is full of educational videos. 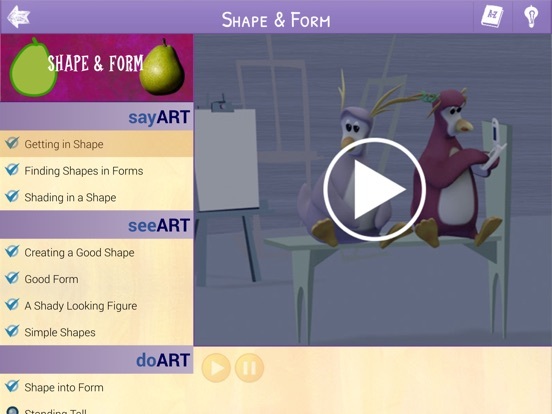 The three animated characters – Furnace, Tickles and Ruby – will guide you through what art is with short educational videos and hand-on activities. And the learning cuts through the traditional subject lines and explores cross curricular relationships with other subjects like math, history and science. 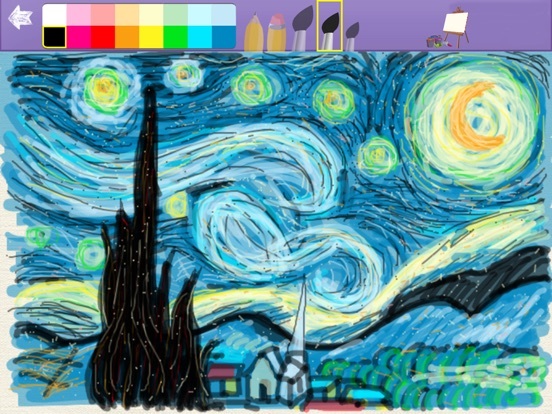 The concept of art is not the easiest subject to explain but this creative app uses videos that are easy to understand and to follow. There are for lessons: ‘Art as a Language’, ‘Messages in Art’, ‘Line’ and ‘Shape and Form’. One note to take into consideration is that you have to be patient and persevere as the app contains many videos and each new lesson is unlocked if you complete all the parts in the previous. Art as a Language: Find out how art is used for self – expression and as a visual language and what you can communicate through art. 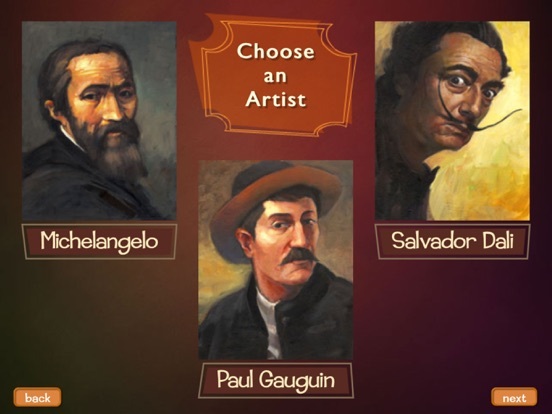 Learn how artists like Leonardo da Vinci, Michelangelo, Paul Gauguin and Salvador Dali used art and what their work process was at times (e.g. Salvador Dali would wake himself up the moment he fell asleep in order to vividly remember and paint surreal dreams he had). The lesson ends with a doodle tool that can be used for drawing and painting - the only remark we have is that the painting didn’t always follow our fingers on the screen and at times the pressure sensitivity wasn’t responsive enough. 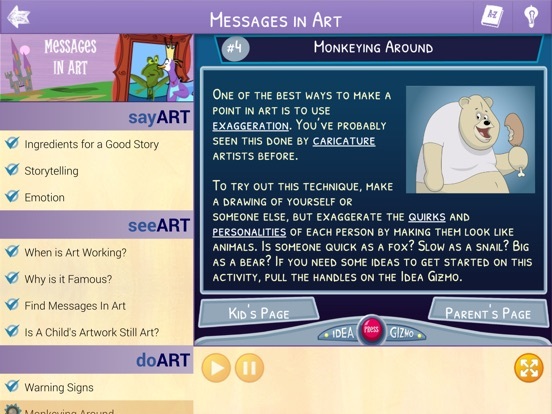 Messages in Art: Learn how to view art and what questions to ask to better understand it. Discover how to tell stories using colours and watch how a cartoony Michelangelo painted The Last Judgement and other iconic images in the Sistine Chapel. The lesson ends with activities meant to make children draw signs and labels to get a message across - the idea gizmo suggested in our case to ‘make a sign to tell everyone there is a ufo landing nearby so people should hide under their beds’. Line: Meet Edgar the mouse and see his cute demonstrations in order to show you how lines can express emotion, direction and action. See how a line from the eye to a perceived object affects an artwork and how a great composition makes strong use of the natural attraction to lines. By creating powerful lines in your artwork you decide exactly what the viewer’s eyes should follow and what should hold his attention. After going through all the videos children can try to draw their own maze and use the idea gizmo for personalising it - we were suggested to draw on one side of the maze a fire-fighter who was trying to find the way over to a burning building. Shape and Form: Use what you learned about lines to create different shapes and try to identify a form only by looking at its silhouette. When we create art we always use interesting shapes and this lesson will help children understand how shape and forms are used in different compositions and also to identify and utilise them as a tool for drawing. Children will be able to create origami models and they can pull the handles of the idea gizmo to get ideas for different animals to make. The app includes an extensive glossary that is useful for users of all ages and our consideration is that the search could be improved with a functional search box. The access to the doodle screen is easily accessible and the game allows saving the art creations to your device. We would suggest that users are asked if they want to save their work before they press the back arrow, as the app doesn’t save the drawing if you exit the screen. The videos are great fun to watch and the activities created with the ‘Idea Gizmo’ will develop your child’s creativity and thinking. There’s no doubt regarding the app’s educational value and we could easily see it used in an educational setting if the teacher manages to synchronize a certain activity within the app. Parent are not left out as they have a dedicated page to be used as a guide in order to supervise and encourage the 8 ‘Creativity Builders’ art projects. In the full online content (all 16 lessons) there are 32 ‘Creativity Builders’. You’ll find information on assignments and what the learning outcomes of the different activities are and soon realise the wonderful fact that kids won’t even know they’re learning. As well as being packed full of fun video content, a recent update has added a new interactive dimension to the lessons. 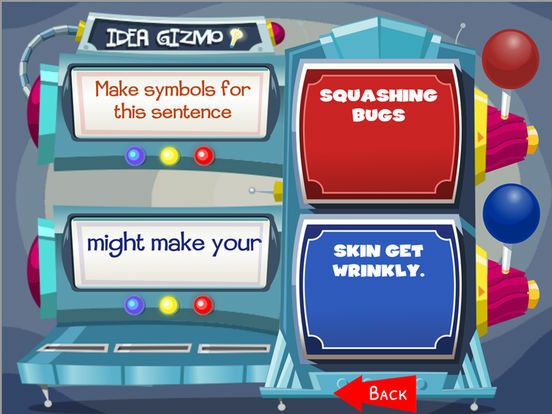 Quite a few of the animations now lead to a section that asks children for their input – sometimes to give their opinion, at other times to experiment with what they have just learned. For example, when learning about lines, children are guided to switch between different styles of line to convey different emotions or aspects to a story. Understanding silhouettes involves rotating an ice hockey playing polar bear and then snapshotting his form. Another interesting form of interactivity allows children to view the different parts of Michelangelo’s artistic process by just showing one stage of what is now a finished artwork. The term interactivity shouldn’t leave you expecting any game-like mechanics. This is not what this app is about. Instead the app uses it to allow children to look through different examples at their own pace or flick back and forth between alternative settings to compare the differences in the current example. Alongside the rest of its excellent content, it is another way to increase the engagement and interest of its users. 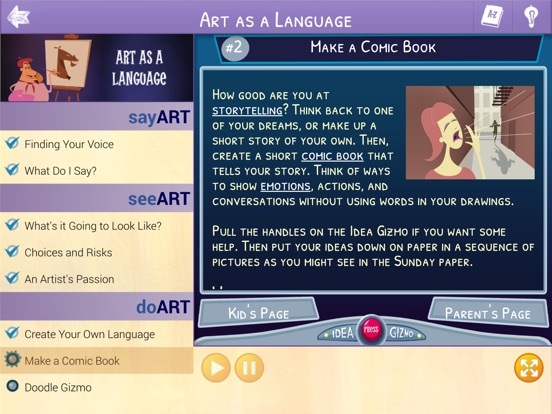 Start with Art contains the first four introductory lessons from Creativity Express. The lessons in Start With Art are designed to begin a child’s journey into the world of art, creativity, and visual learning. 8 'Creativity Builders' art projects give children hands-on experience using knowledge from each lesson. Two projects per lesson, the topics range from creating your own language to creating model sculptures. Art as a Language: Art is a visual language, used universally for self-expression. Learn what it means to communicate through art and follow the notable work of Leonardo da Vinci. Messages in Art: Artwork tells a story using emotions, feelings and pictures. Learn to ask questions when viewing art and discover the meaning of Michelangelo's illustrations on the ceiling of the Sistine Chapel. 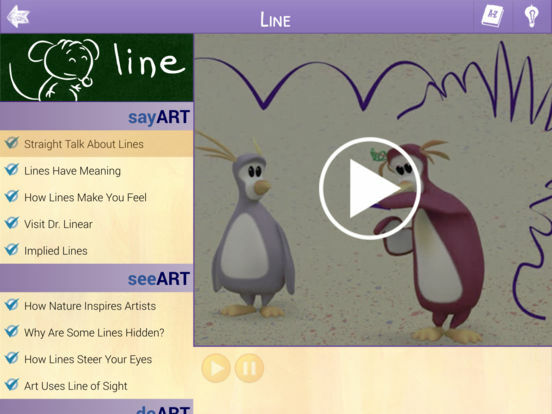 Line: An important tool for artists, lines can convey direction, emotion and action. 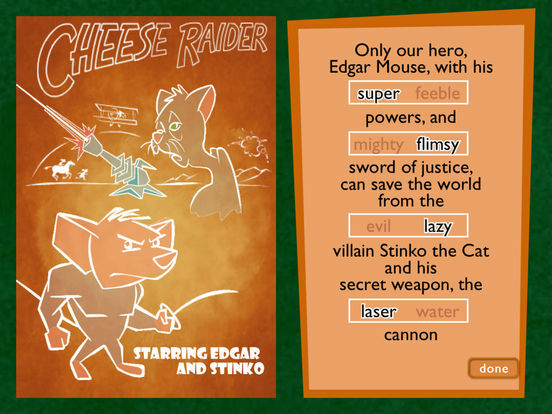 Edgar the mouse demonstrates how each of style of line can have a different meaning, and demonstrates how children can use this technique in their own artwork. Shape and Form: Forms are often represented with shapes. Use your knowledge about lines to create shapes. Try to identify a form by looking at its silhouette in notable artwork.